Crochet in Rounds. How to Read Crochet Charts. 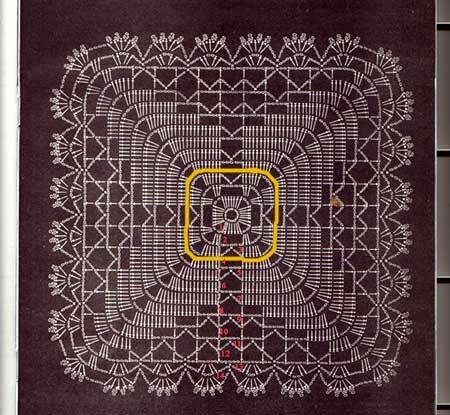 When a crochet in rounds pattern is pretty intricate, it is not easy to describe it in words. Charts help you to visualize a pattern and understand its logic. When you don't have any experience working with crochet charts, they look pretty confusing from the first glance. Meanwhile, all crochet pattern designers follow the same simple logic when they draw a crochet pattern chart. Otherwise, they would never understand each other. 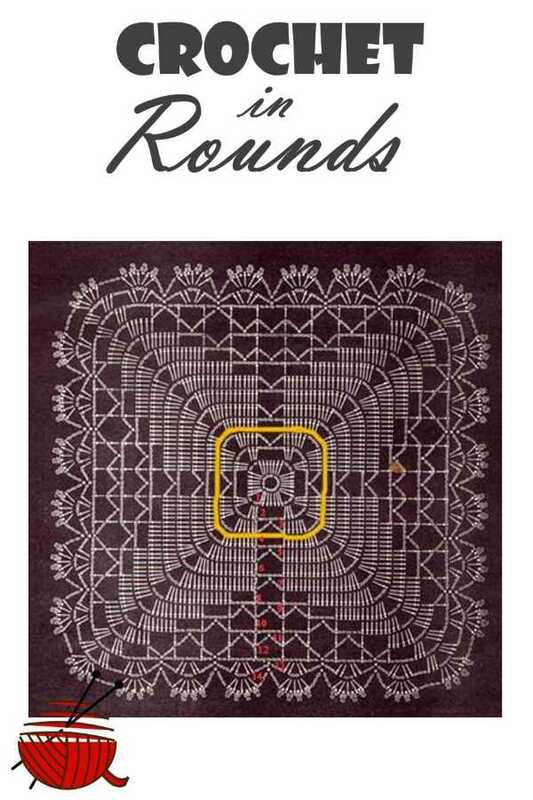 Here is an example of a crochet in rounds pattern. Yes, it doesn't look round, it's almost square. But you would use the same technique of crocheting whether you need to make a circle, square, rectangular or any other shape. 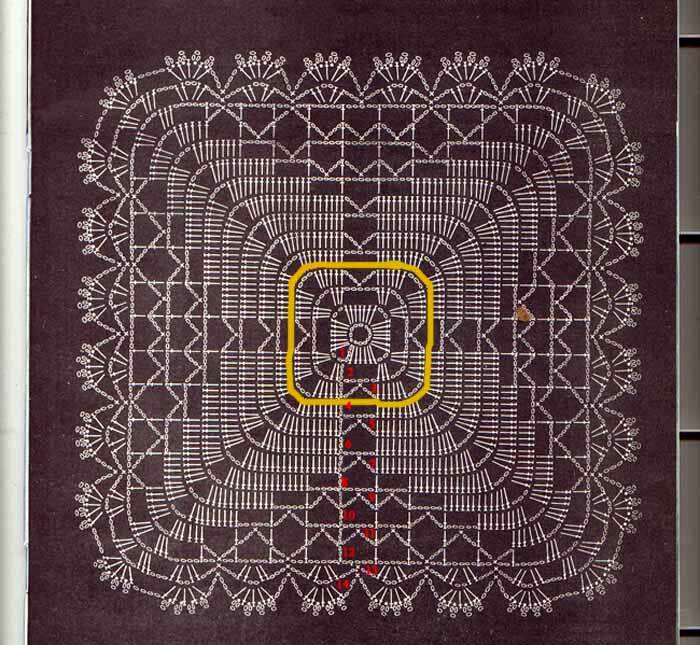 To crochet any of those shapes, we would apply the crocheting in round technique. Let's follow it step by step. A large picture gives a general idea about pattern. Click to enlarge the picture in a new window. 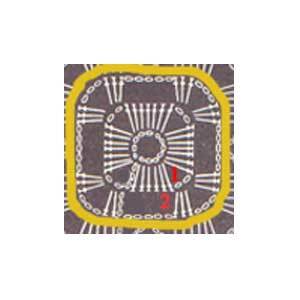 A yellow frame is used to show the three first rows of the pattern. Follow these instructions, to crochet each of them. 1. A pattern begins from the chain ring made of 12 chains. A slip stitch connects first and last chain into the ring. 2. There are 14 rows (see the red numbers) in this pattern. 3. Three kinds of stitches are used to form the pattern: chain stitch, single crochet, treble crochet (US terminology). 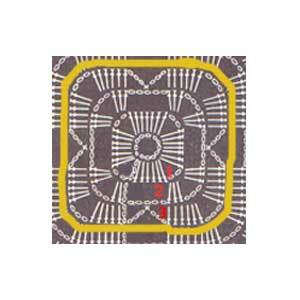 (See the Crochet patterns page for crochet symbols.) Besides that the 14th row has picot stitches to form a neat edge. ROW 1. (inside the yellow frame). Read chart and crochet counter clockwise. 12 ch join into the ring. Crochet 3 chains for height (count that as the first treble crochet in a group of 7 treble crochets), 6 treble crochets into the ring, 2 chains. Crochet 7 treble crochets into the ring, 2 chains - repeat 3 times, slip stitch, to join first and last stitch of the row. ROW 2. 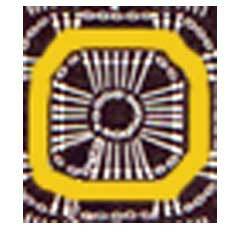 (inside the yellow frame) Read chart and crochet counter clockwise. Crochet 3 ch for height (count that as the first treble crochet in a group of 3 treble crochets, 2 treble crochets under two chains of the 1st row, ( 3 chains, 3 treble crochets under two chains of the 1st row, 5 chains, 3 treble crochets - repeat 3 times). 3 chains, 3 treble crochets, 5 chains, slip stitch, to join first and last stitch of the row. ROW 3. (inside the yellow frame) Read chart and crochet counter clockwise. Crochet 3 ch for height (count that as the first treble crochet in a group of 6 treble crochets), 5 treble crochets, ( 3 chains, 6 treble crochets, 3 chains, 1 single crochet, 3 chains, 6 treble crochets - repeat 3 times). 3 chains, 6 treble crochets, 3 chains, 1 single crochet, 3 chains , slip stitch, to join first and last stitch of the row. FOR MORE Practice about reading crochet charts check TryCrochet.com.